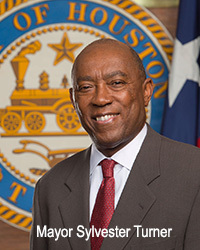 Mayor Sylvester Turner serves as the Executive Officer of the City. As the City's chief administrator and official representative, the Mayor is responsible for the general management of the City and for seeing that all laws and ordinances are enforced. Administrative duties include the appointments, with Council approval, of department heads and persons serving on advisory boards. As Executive Officer, the Mayor administers oaths and signs all motions, resolutions and ordinances passed by City Council. The Mayor also serves a legislative function, presiding over City Council with voting privileges. The Mayor is responsible for advising Council of the City's financial condition and presents to Council an annual budget for approval. January 4, 2016 -- The Bible I held this morning was the Bible I held 26 years ago when I was sworn in to represent my district in the House of Representatives in 1989. My mom was part of the celebration and sat next to me on the floor of the Texas House, and although she is not with us today, she is with me in spirit and always will be. My father, who worked at Continental Emsco for 31 years, was a yard man and died when I was 13. 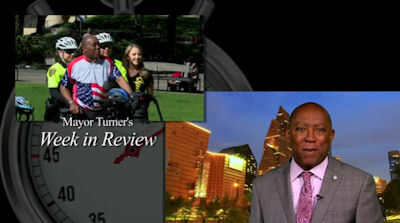 To access the City of Houston Newsroom, go to www.houstongovnewsroom.org.